All plants are nursery-propagated in south-central Kentucky & most come from local source seed (see About Us). No plants are harvested from the wild. Shipments is via Priority Mail 2-Day via the U.S. Postal Service. Larval host plant for the lovely blue and black Pipevine Swallowtail butterfly! Leaves are blue-green and heart-shaped. Flowers resemble a little pipe. Grown from Kentucky-source seed. 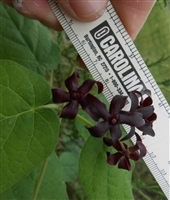 This is a vine in the Milkweed Family that has milky sap and hosts the Monarch caterpillar. The leaves are opposite and heart-shaped. Unique and attractive flowers are a deep purple, pods are "spiny" but not sharp. Often found on basic soil near streams. Grown from Kentucky-source seed. A member of the Milkweed Family, this vine 'hosts' or feeds the Monarch caterpillar. It exudes white sap when injured. It is named for the ridges or angles on the surface of the pods, has opposite heart-shaped leaves and interesting green or green-&-purple star-shaped flowers. Grown from Kentucky-source seed. Flowers are unique & showy, complete with "frills." Larval host to the Variegated Fritillary (caterpillar pictured in slide show), Zebra Longwing, Red-banded Hairstreak, and Gulf Fritillary butterflies. Under favorable conditions Maypop may spread readily from underground roots. Consider a contained situation in the home garden for long term ease of care. Grown from Kentucky-source seed. Gorgeous trumpet-shaped scarlet flowers with orange throat attract hummingbirds & butterflies. Growth form tends to be "bushy," filling out nicely against a support. Easily trained to a trellis or arbor by tying & trimming to shape. Red berries feed birds in fall. 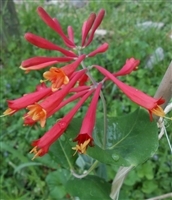 Strong, fast-growing woody vine bearing trumpet shaped orange to red 3" long flowers. Attracts and supports hummingbirds and ideal for creating a tall, densely covered privacy trellis. Grown from Kentucky-source seed. A delicate vine with tri-lobed leaves & small chartreuse flowers (~1/2 inch wide) that yield purple-black berries. Most often seen in moist, rich woods. Grown from Kentucky-source seed. Also called Carolina Moonseed, Carolina Coralbead, etc. Clusters of fleshy red berries in late summer provide food for birds. Leaves are variable, from oval to lobed. Grows in edges of woods, among hedges, streamside. Male and female on separate plants. Grown from KY source seed.